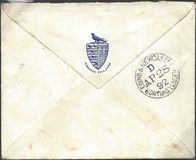 1908 ½d Yellowish Green, SG 218, tied to postcard to London by a fine FIFE SORTING TENDER UP/=458= cds. Scarce Index 'A'. W 788.